Buying the best pomade for thick hair is critical if you want your hairstyle to stay styled all day. Like pomade for curly hair or any hair type, it takes a good men’s pomade with a strong hold to style thick, coarse hair well. Although thick hair can sometimes be a burden to manage and groom, the right styling tools can make the process easier. Check out our reviews of the best men’s hair products for long, thick hair to find the strongest pomades suitable for your hair type. This list of the best pomades for thick hair exclusively includes water-based pomades. While oil-based hair products offer a stronger hold, they are notoriously difficult to wash out and can cause skin irritations. For this reason, we’ve specifically reviewed the best water-based pomades for thick hair. We made sure to take many different factors into consideration when choosing the highest-rated styling products, including hold, shine, price, smell, ingredients, and customer ratings. You’ll quickly notice that these products all come from some of the best pomade brands in the industry! Guys can’t go wrong with a good pomade from Suavecito, Layrite, Uppercut or Imperial Barber. Here’s a detailed review of why men should buy these top pomades when styling their thick hair. 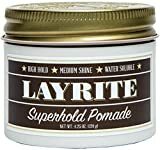 Layrite is one of the most popular pomade companies in the world. The brand offers a number of hair products for different hair types, hold strengths, and shine levels. For example, you can choose between a Super Hold and Original Hold Pomade, both of which give hair a medium shine. However, the company recently introduced Natural Matte Cream Pomade – a medium-hold product with a matte finish. Ultimately, Layrite Super Hold is the ideal choice for guys with thick hair. As a high-hold pomade that allows you to restyle throughout the day, Layrite is a strong pick! Plus, the sweet vanilla scent smells great. We even recommend it for thick, curly hair that’s hard to control. And with 1000+ Amazon reviews rating the product very highly, you can feel confident buying Layrite! If you’re looking for a quality brand dedicated to delivering a world-class product, choose Layrite! Suavecito is another brand that doesn’t need an introduction. As a very popular pomade, Suavecito also offers a deep line of men’s hair styling products. Known to hold like wax and wash out like gel, Suavecito Pomade comes in Firm and Original versions. Nevertheless, for men with thick hair, we can only recommend their strongest pomade formula – Firme Hold. Considered a cheaper alternative to Layrite, Suavecito Firme Hold provides a high hold, medium shine, and cologne-like scent. And as a best seller at Amazon, Suavecito Pomade is perfect for all types of hair and hairstyles! If styling your hair properly is important to you, Suavecito is certainly worth the investment! For one of the strongest pomades in the industry, look no further than Imperial Barber. Considered an industrial-strength styling product, this low-shine pomade works great with any kind of hair that needs control. However, guys can dilute the strength by simply using more water while styling. With a nice scent that is noticeable but not overwhelming, Imperial Barber Pomade is a solid choice for men with thick hair trying to style any type of hairstyle. Baxter of California is one of the more premium pomade brands on the market and certainly lives up to its classy reputation. The company’s Clay Pomade works great with thick hair because of its strong hold. In fact, the hold lasts all day due to natural ingredients like clay and beeswax, allowing guys to define and mold hairstyles yet keep their hair in place. 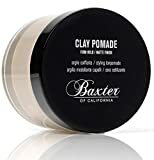 Due to its matte finish and pleasant scent, we recommend Baxter of California for guys wanting to style thick, textured hairstyles such as quiffs, pomps, spikes, and slick backs. As a luxury styling pomade that’s made with high-quality ingredients, try Baxter! 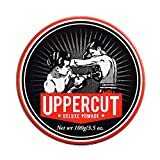 Uppercut Deluxe Pomade is likely another popular brand you’ve heard of. As an Australian company that sells multiple styling products, Uppercut’s most highly-rated pomade is their Original formula. Good for thick hair, this pomade comes with Uppercut’s signature scent – a light coconut and vanilla smell you’ll love. We recommend the Uppercut Deluxe Original Pomade because it offers medium to high hold with moderate shine and seems to be easy to style hair with regardless of your desired hairstyle. American Crew is the largest men’s hair product company on this list. Despite not having a cult-like following like the rest of these pomade brands, American Crew delivers a solid styling product. Their medium hold, high shine pomade can be applied to wet hair for easier application but softer hold, or dry hair for a stronger hold and more matte finish. And with a mild, natural smell, it’s great for guys who want to avoid overpowering scents. A versatile styling product for men, American Crew Pomade is our choice for guys with thick hair who don’t need the strength offered by these other brands. Styling thick hair can be challenging, especially when your hair product of choice isn’t as powerful or high-quality as the ones we listed above. If you want to style the best men’s hairstyles every day, invest in the right styling tools for your hair type. And for guys with straight, thick hair, that means checking out our highly-reviewed pomades for men.